Family Volley: Motherhood - How Not To be a "Tiger Mom"
Motherhood - How Not To be a "Tiger Mom"
You might recall a few years ago, when I was asked to read Battle Hymn of the Tiger Mother for the TLC Book Tour. Well, a rebuttal has been published, and TLC asked if they could send it my direction. 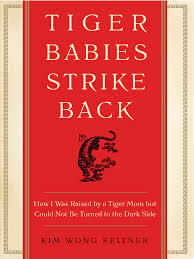 Tiger Babies Strike Back, continues to open our eyes to the Chinese way of parenting. But unlike many Chinese children, Kim Wong Keltner fought back. And she fought back hard. The book didn't hit me so much as a rebuttal, more of a complilation of Kim's experiences and how she handled them. Her message is clear. She didn't like how her Chinese mother treated her. She doesn't like the Chinese way of parenting, and she does not parent the Chinese way. So what is a "Tiger Mother"?" According to Keltner, "A tiger mother offers no hugs, no sweet nothings whispered into soft little ears, not even a smooch good night. Tiger moms don't exactly cuddle. They don't kiss your boo-boo's when you stumble or scrape the skin off your leg. They are detached, practical to a fault, and don't believe in reassuring. They rule with absolute authority and corporal punishment." Nothing about the description sounds like motherhood to me. I do not believe that motherhood is cold, or harsh, or forceful. But...Tiger babies left me thinking about motherhood, and how the message of the book applies to all of us. Here are 5 ways NOT to be a Tiger Mother. Keltner talks about being a silly as a child and posing for a kiss from her mom as she came up the stairs. Her mother refused and called her actions disgusting. One of the worst things we can do as a parent is to withhold our love. For any reason. Even when our children are being silly or misbehave, we still need to love them. Always love them. And not just when they leave for school, or when you put them to bed. Show love on a random Saturday just because your child walks past you in the kitchen. Showing love is not a weakness, nor does it condone misbehavior. 2. Don't Compete with other moms, Cooperate. This is one of my favorite statements in the entire book. Comparing our children to other's children is not going to inspire our kids to be better. Neither is telling our children all about the successes of other children. Even though we think it might. Maybe in the short term it might get us results, but in the long term it hurts their esteem, efficacy, and our relationship. Just because our children excel in something that our friends children do not, doesn't make us better moms. It is true that our children are a reflection back on us, but controlling them, so we appear a certain way, is not good for us, or for them. Tiger Mother's are always jumping ahead. They are never in the now. So concerned about their child being successful in the future, they don't care about what is happening at the moment. Good mothers are in the present. They are worried and planning for the future, but that is not at the expense of right now. I learned this the hard way. When our son was about 7, I was helping him learn basic multiplication. No matter the object lessons, diagrams, or explaining, it just wasn't making sense to him. Laced with frustration I said "if you don't figure out this multiplication, you won't ever get into college." You can imagine the blank stare our 7 year old sent my direction. He needed help with 2 x 2. He didn't ask anything about college. By not focusing on the present, I sent him a message that I didn't care about what he was saying or needing now. It conveyed the message I wasn't listening. Now, does he need to understand multiplication to get into college, yes! But that is for me to worry about in my head, not out loud. He doesn't have the experience or wisdom to understand those grown up topics. We have to stay right with them, right in the moment. So they trust us and know we are listening and care about the now. I was reminded to be present again just this week. Our daughter was telling me a story. I was "listening", but the second she was done talking I asked if she was ready for swim. She looked at me and said "Mom, I wasn't even talking about swimming." Again, stay in the present. 4. Don't let our expectations paralyze us. Tiger mothers have expectations. These expectations span generations. Nothing matters but fulfilling those expectations. As mothers we have to be really careful with our expectations. Ours might not be as absolute as Chinese mothers, but we all have them. It is easy to become paralyzed and close minded when our children don't meet up to those expectations. I have been learning this over the last two years with our son. For three generations on my side of the family, we have played baseball. Not just little league, but at a collegiate level. My grandfather, my father, and both of my brothers all played. I always expected that our son would do the same. I had these expectations and beliefs about how he would carry on the tradition. Well, it is hard to admit, but he is not passionate about baseball even though he enjoys it. I found myself being very resentful toward him when he wasn't putting forth the effort I felt was needed for him to be on the "collegiate path." I have had to let go of my expectations, see our son for who he is, and support the things he does love and is more passionate about. For a short time, I was paralyzed. I was not flexible or understanding to his feelings at all. This caused stress in our relationship and tainted how I treated him. Tiger mothers expect perfection. And if it is not reached, then their children have failed. No one is perfect, including our children. And until we are perfect, we don't have any room to expect perfection from our children. They are children, they are learning, and so are we. We need to let them to human and normal and learn and grow. They are always willing to give us more chances to get things right as we navigate this parenting gig. We owe them the same respect. I enjoyed Tiger Babies Strike back. I appreciated learning more about how other cultures parent. The book is easy to read, entertaining and humorous. The situations in the book made me take a step back and ask if I ever act the same way. Because I don't want to act that way. I can't imagine raising my children the Tiger Mother way. I don't see how it allows our children to grow or to develop. We do need rules, we do need consequences, we do need to help lead and guide and push our children as they learn and develop. But we will find more success and happiness when we mother with love, and compassion and patience. Opposed to close minded force. I love how this book shows us that we can be a transitional character and make the future better. Maybe we grew up in a home where parenting was not a strong suite. Maybe we grew up in a home where our parents did a fantastic job. Either way, we decide what we will pass on, what type of parent we will be and what we like and didn't like about our upbringing and why. We can make changes, modifications and do better. Every generation can do better. Where you raised by a tiger mother? Have you ever had to let go of an expectation you have had? What characteristic(s) do you think, makes a good mom? Some aspects of the Tiger Mother book totally shocked and appalled me, but some...not so much. I think sometimes we are too easy on our kids, too quick to let them give up. I love what she said about confidence, about how achieving something they thought was impossible was what would really make a child confident. I agree with that. But still, I couldn't imagine screaming at my kids for hours the way she did over piano practices. Kids should get to be kids. This looks like an interesting read. thanks, Heather! Although my review of Tiger Babies is quite different from yours, I enjoyed your review, and your list, Heather. Could I please correct what is said about 'chinese mothers'? Do people realize what's described here about 'chinese mothers' are really just some of them, not even many. My mom, a chinese one, is no doubt one of the most caring, loving, and supporting moms in the world.